The Kole ("Coal-eh") or Yellow-Eye Tang has much going for it as an aquarium species... It's hardy, undemanding in its food preferences, very easy-going toward other fishes and invertebrates, good looking and interesting behaviorally... And thankfully they're relatively abundant and easy to catch in the wild! There is no wonder why this is such a popular marine aquarium fish for one good reason not mentioned above; its penchant for picking at filamentous and soft encrusting algae... an occupation that takes up most all their day-time activity in captivity and the reef. The Kole is a member of the genus Ctenochaetus; one of the six genera of Acanthurids, the family of Surgeonfishes, Doctorfishes, otherwise known as Tangs. Ctenochaetus comprises nine of the seventy-five or so described species of Surgeonfishes. Specialized mouths and teeth ("cteno-chaetus" means "comb bristle" define the genus' members. Unlike other surgeons that have rigid, attached dentition, Ctenochaetus have movable, individual, bristle-like teeth. Coupled with a protrusible, outreaching mouth, these fishes use this unusual feeding device to sort and remove interstitial fauna, scrape soft algae, and "detritus" of nutritive value from rock and substrate. This fish attains a length of about six inches maximum... Distribution is limited to Hawai'i and Johnston Island... All specimens are wild/collected, imported from Hawai'i. Ctenochaetus strigosus Bennett 1828, the Yellow-eyed or Kole Tang; since this and the Chevron Tangs range encompass the principal islands of Hawaii they are the principal species utilized in the West. The Kole ("coal-ay") is more shallow water, surface to sixty feet or so, and the chevron is generally collected in fifty feet plus. At right: in an aquarium. Below: in Kona and Maui. There is only one species of Kole... all have a variably yellow circle of yellow around their eyes. As mentioned above, during the light hours a healthy Kole will be literally hopping/skipping motion swimming over the hard surfaces of a native or aquarium reef, looking for and picking at algae and detritus for food. At night time, like most reef fishes, you'll find your Yellow-Eye Tang resting on the bottom, next to or among rock. A frequent issue we hear/read on WetWebMedia.com is the concern over this fish's "pacing" behavior. This most often manifests from the fish seeing, reacting to its own reflection (though you're not able to see this through the side panel)... Almost always, temporarily covering the outside with a piece of paper for a while will cure this territorial behavior. Some folks have reported that their Kole was disagreeable with other fish livestock; but it's been my experience that the vast majority of this and all other Ctenochaetus Tangs get along with most all tankmates... with the exception of other fishes that occupy their "niche"... that is, mainly other Ctenochaetus and similarly shaped fishes (Zebrasomas mostly) and some Rabbitfishes... that look like and feed on similar types of algae (filamentous attached). There can be some "sparring" to be expected if these sorts of fishes are placed too close together, in cramped quarters.... Similar fishes, particularly other Acanthuroids, like the Siganids (Rabbitfishes) require a good fifty gallons per specimen to keep together. The same applies to trying to keep more than one Kole in a system. They need a minimum of fifty gallons of space per specimen. Even with this roominess, some sword- or tang-play is to be expected... and it's advised to do the usual moving of a good deal of the rock ahead of any newcomer addition, and to keep the lights off for that day to reduce territorial aggression. This and most Ctenochaetus tangs ship very well, and are generally received in good condition, eating well within a day of arrival. This being stated, there are the usual "few criteria" to pick out a good to best specimen. 1) Size: at purchase; small specimens, less than three inches overall length, have higher mortality rates. If you're going to risk one of less dimension, I'd definitely leave it at the dealers for a couple of weeks and be assured that it was feeding before taking it home. 2) Feeding: Here we go again with this "acid test"; especially important with fishes such as the algae-scraping Bristlemouth Tangs that, once off food due to mouth or other trauma, nearly always perish. If the fish is not eating, wait till it does to buy it. At right, a Yellow Eye, Kole Tang (C. strigosus) with a bad mouth: doomed. 3) Behavior: the element of "brightness", curiosity in the environment, normal swimming and evasiveness cannot be discounted. Buy well-adjusted specimens. A good fifty-sixty gallons is a minimum volume to house one of this species... at least twice this if you want to try two together, or other related Acanthuroids. Plenty of healthy, established live rock, vigorous circulation, filtration and aeration complete the picture of a good physical system for Ctenochaetus. Though this species feeds almost exclusively on attached filamentous Green & Red algae species in the wild, it generally adapts quickly to other food formats and kinds in captivity. Some meaty foods like Cyclop-Eeze, Mysids and Artemia are a good idea to mix in at least weekly, with live algae (Gracilaria/Ogo, Spirulina...) being best, prepared algae products like Nori wafer not often taken. Of course, having an abundance of healthy live rock with its constituent algal component will go a long way to providing continuous forage for your Bristlemouth Tang. Unless your dealer has very good feeding practices, it's best not to leave Koles (or other Tangs for the matter) at your dealers for too long. In fact, this is one genus where quarantine, and its too-often evils of vacillating water quality and starvation is best skipped altogether, in favor of an extended pH adjusted freshwater dip/bath. Oh, and do take care if handling this fish, even in a net... take care if/when supporting it in there with your bare hand... The stiletto like "tang" on their caudal peduncle is very sharp... and they know how to use it. Unless your Kole (and other tankmates) have discernible protozoan involvement, anomalous signs of ill-health, like brown spots and blotching are best treated with products that bolster immune systems... Vitamins, HUFAs, Beta Glucan... Almost always, such troubles are directly or indirectly related to either some aspect of diminished water quality or aggression by tankmates. If you must turn to formalin and/or copper compounds, do administer these stringently on the low side of dosing. 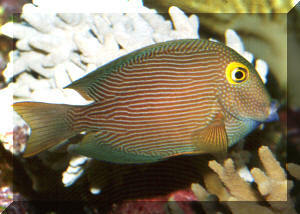 They Yellow-Eye or Kole tang is deserving of much wider use in our aquarium interest... It's a hardy, hard-working algae scraper that is attractive, non-aggressive, doesn't get too large... and is relatively abundant and easy to collect in the U.S. 50th State's waters... Do you have space, a need for such a diligent worker? Debelius, Helmut. Undated. Interesting information about surgeon (sic) fisch- III The Ctenochaetus genus. Aquarium Digest International #31. Jones, Lawrence L.C. 1988. Care and maintenance of tangs in captivity. Part one: Food and feeding. FAMA 10/88. Randall, J. 1955. A revision of the surgeonfish genus Ctenochaetus, Family Acanthuridae, with descriptions of five new species. Zoologica 40:149-165. Randall, J.E. 1988. Three nomenclatorial changes in Indo-Pacific surgeonfishes (Acanthurinae). Pacific Science 41:54-61. Randall, J.E. 2002. Surgeonfishes of the World. Bishop Museum Press.